We were really surprised to discover how easy it was to make biscotti (and I use the term “we” loosely because my mom did all most of the work while I sat back and commentated). It seems like a a fancy treat, and while there are several steps involved so that it’s not exactly a quick recipe, it really wasn’t difficult at all. In fact, my mom is planning to make this one again this holiday season because she loved it so much. She did say she’ll leave them undipped next time because she liked them better in taste and appearance that way, although I’m kind of partial to the dipped versions. Serve these at a brunch or evening get together, wrap some up as a fun hostess gift or add to a coffee lovers’ gift basket! Original recipe from Land O’ Lakes. Preheat oven to 350 degrees F. Cream butter and sugar together in a large bowl at medium speed. Add eggs and continue beating until blended. Slowly add flour and baking powder, beating on low until completely mixed. Add crushed candy. 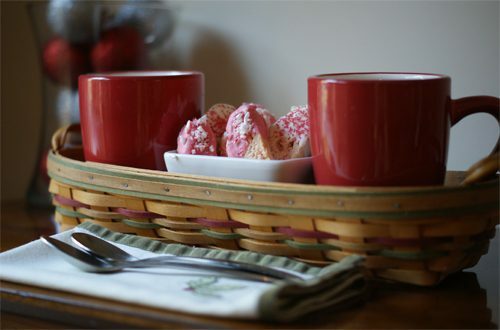 Optional: Melt almond bark and add red food coloring and peppermint extract. Carefully dip the biscotti halfway in the coating, letting the excess drip off. 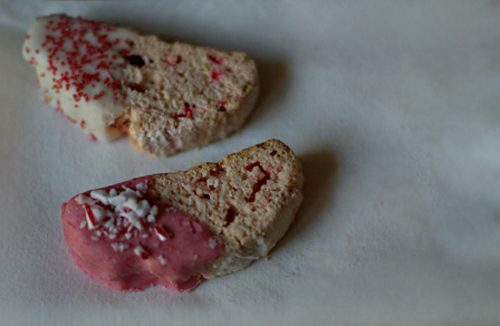 Place on waxed paper and add sprinkles or crushed candy canes. Allow to harden at room temperature.